According to the Original Tooth Fairy Poll® by Delta Dental, average monetary payouts are down $0.43 from last year, bringing the current rate to $3.70 for a single lost tooth. $3.70 a tooth – can you believe it??? But don’t worry, because not all hope’s lost… The Grand Daddy of all prized teeth (the *first* one lost) is still holding strong at a solid $4.96. Whew. And don’t think this isn’t applicable to the national economy either, oh no. 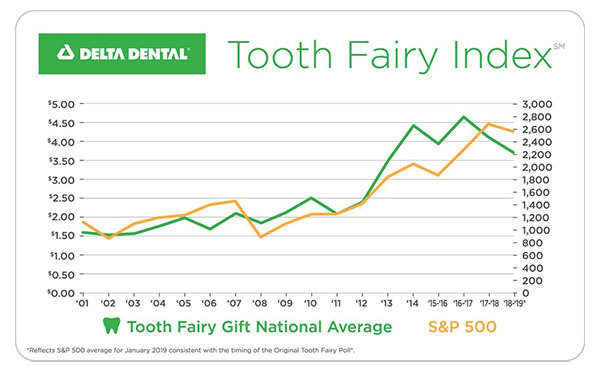 The Original Tooth Fairy Poll has typically served as a good indicator of the economy’s overall direction, tracking with the movement of Standard & Poor’s 500 Index (S&P 500) for 14 of the past 17 years. A year ago, a single lost tooth was valued at $4.13 and dropped to $3.70 in this year’s survey, down 10 percent. Over the same time period, the S&P 500 also saw a decline and decreased by 3 percent. On a more serious note, though, the Tooth Fairy did just pay my son a visit last week, and he’d be proud to tell you that he got a 33% increase from the last score if he knew how to do math ;) Though to be fair, the TF around here only bases her gifts on “the cool factor” over any specific amounts, as my kids still couldn’t tell you the difference of what 100 cents can buy you vs $100. To them for some reason everything costs $100?! But hey, more cheap goodies for my kids! Because ain’t no way I’m shelling out $4.00 or $5.00 for a vagabond tooth… They can’t even do their job and STAY IN THERE! 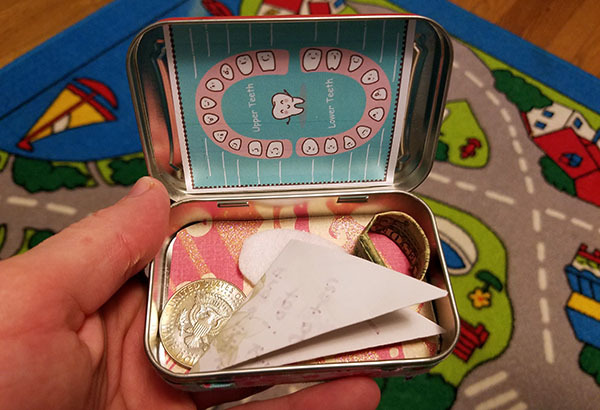 Plus, my kids get more joy out of playing with their homemade Tooth Fairy container than they do the contents that finds its way in there anyways… And I don’t blame them, look how fun they are! Thoughts/Comments/Concerns – share below and we shall discuss! No kids here so I can’t comment on this except to say, I think the tooth fairy only left me 50 cents per tooth when I was a child. Wow, inflation has really gone wild since then! At least the $1 gold coins are cool, like pirate treasure. I got dead dudes on ‘not quarters’. What is a 6 year old supposed to do with an Eisenhower dollar, or a Kennedy half dollar? The machines at the grocery store took quarters for those toys in the plastic bubbles. I probably got some $2 bills as well, and those were nifty. Thanks for keeping us up to date on the TFI! Kids these days apparently need to come up with their own Side Hustle to make up for this decline in income! My two sons were totally grossed out when they realized my mother (their grandmother) saved all my teeth and gave them to me later in life. Oh oh, hope no little kids read your blog. 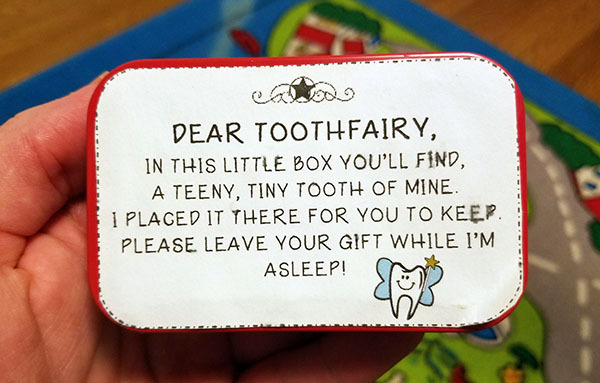 Kids, my mother was a close associated of the Tooth Fairy….. I saved my kids’ teeth so they could use them for Science Fair projects later on. Like – what happens to teeth when you soak them in soda. AHHH love that!! excellent idea! I think it’s crazy what kids get for teeth these days. I don’t have a kid but I have a nephew and friends who have kids and from what I have heard that northeast average is kind of low. Around the Boston area, it’s more like $20 for the first tooth and $5 after that. Quite a bit more than the 50 cents I got in the late 80s. My parents never gave me money for my teeth! I used to put my teeth under my pillow and get disappointed the next day when I didn’t find anything! They need to get a spanking for that. The Tooth Fairy Index! Who knew? If I had children, I would totally craft a box like the one in your blog. It’s a rite of passage and should be honored accordingly! Looks like I am cheap, the kids get $2, a nice crisp $2 bill. I don’t think they spent any of them. If all goes well it widens the path to raising two collectors. Btw – featured your blog in my newsletter last week! Big fan! Our kids have a little tooth pillow with a little pocket. Makes much less noise when you are trying to make the exchange. Also, our oldest is 10 and he kept kept losing teeth so we just told him the TF was us but that we would still give him money. I feel like in 5th grade if you go into school and say you got money from the TF you might just be asking to get made fun of. Also, why we told him about Santa this year. I don’t want kids teasing him. I guess also I don’t really know what age is appropriate to tell them as I was 5 when I figured it out. My kids are so sweet and innocent and are always telling me what their friends are saying and what’s “stupid” or “not stupid” and I have to keep reminding them that it’s up to THEM to feel what’s stupid or not! And that you’re allowed to believe in whatever you want to believe in so ignore it all.. Elementary school is fine, I just wanted my oldest to know before middle school next year. There is no way you don’t get teased at that point. Normally, the missus is in charge of that and she usually gives $1 or $2. When we in Thailand by ourselves last year, I gave him 100 baht. That’s about 3 dollars. He pulled the tooth out himself so I think he deserved it. And he needed a little spending money so he can buy some stuff. It worked out. Strong little dude! Haha… Def. a well deserved $3. Any kind of funny money: foreign coins, Susan B Anthony dollars, etc. The hubby stops at the bank and asks for whatever foreign coins they happen to have. TF is more likely to bring a nature themed trinket. Any shiny gem, Tiny animal sculptures, things like that. I have found some cool things like that on Etsy and at local shops. You just have to keep your eyes open because the key is to always have something hidden away. These situations that require a TF can sneak up on you! But the most important thing is that your children understand just how busy TF is. It is well established fact in our house that TF comes ASAP, which might be days after you 1st put that tooth under your pillow, lol! Haha – you have got this game down!! The tooth fairy has forever left those gold dollar coins at our house. 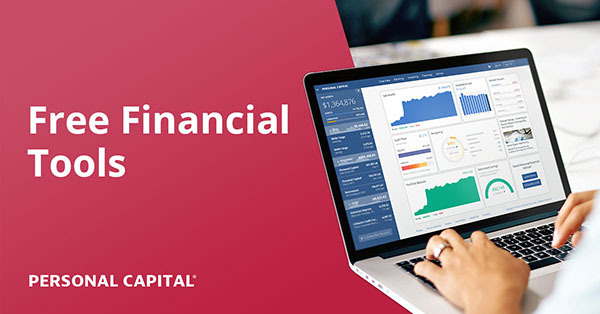 You just buy a roll at the bank, and never run out! Well….I have found a few around the house at times that I put back into my stash ! I think that’s called recycling! This post is so timely! My oldest has a dangling tooth- his 5th? 6th? Who knows? I went to the bank yesterday for a TF withdrawal. This TF gives the gold dollar coins. I don’t like $2 bills for some irrational reason, but my kid loves the gold coins, they seem like treasure to him. Thanks for the post, love your blog! Love you for reading it! WHO ARE ALL THESE PEOPLE GIVING THEIR KIDS BIG BUCKS FOR TEETH!?! I do live in the midwest where the average is the lowest but seriously!?! My son swallowed his first tooth while eating lunch at school. He wrote the tooth fairy a note explaining what happened. She did leave him $1 and note asking to make sure he didn’t swallow the next one. After all, she’s in the tooth business. When he lost is second tooth (this one not swallowed!) he got $1 for that one. That means his entire mouth will cost $20 (unless he needs braces-Lord help us). I’m hanging my head in shame as one of the big spenders for teeth. We pay $5 per tooth. But in my defense, we accidentally set the bar high. His first 2 teeth were extractions so warranted a little extra. We wanted something per tooth, plus the extraction and as a non-cash family, all we could scrounge up was 3 $5 bills. Every tooth my son has lost has been relatively dramatic if not traumatic though (a headbutt from the dog, a failed attempt to do the string trick, lost in a burger, and almost swallowed overnight) so he actually probably deserved the $5 each time. We usually gave our kids a dollar, and they were happy…but later would mention that a friend got more :/. When they were a little older, and the dentist was going to have to start pulling the slow-to-fall-out teeth, we offered them $5 for any teeth they could wiggle out on their own! Saved us a little money on the dentist bill! Previous post: When was the last time you treated yourself?